I have a love/hate relationship with December. I love that Johanna is excited for her birthday and Christmas, and I love that Abby will be home from college for an entire month … but I hate that there’s such a focus on commercialism coming at us at every turn. I mean, we’ve been seeing holiday commercials since, like, before Halloween. So to battle the funk that usually settles in my soul this time of year, I decided to take a different approach to December: Namely, to make a list of those family activities that we enjoy and focus just on that, to make my health a priority (take all the naps!) and to clean out our stash of holiday decorations. I have been a minimalist for years now, and we have decluttered most of the house at this point. But what we have never gone through is our Christmas decorations. Because the opportunity window is short. Because it’s easier to stick that mess back into the various boxes and then out of sight in the basement. Because I do not have the energy to deal with such a project with everything else on our December radar. Bean was instrumental to the process. It’s actually been a while since I’ve had to declutter anything in earnest, though, and I was foolishly looking forward to getting started. I have a cedar chest that’s been used as a dumping ground for all manner of thing since I purchased it for my high school graduation. It’s been a dream of mine to use it to store our blankets and quilts — and I made it ground zero of Operation Holiday Declutter. I opened the chest after work one weekday evening, thinking I could get it all sorted in an hour or so. I pulled everything out. I made a few piles: Easter decorations here, fall decorations there, and hey, I found our Christmas stockings! So I hung those up by the wood stove. And then I succumbed to utter despondency. There was just SO MUCH stuff. I ended up taking off the top layer because the more I looked at everything, the more anxious I felt. After my hour time limit, I had a bag of things my mother wanted, another to donate to the church rummage sale, one to take to work for people to paw through. I put those in the living room so I wouldn’t forget to deal with them later, then tossed everything else back into the chest. Ugh, the reek of failure is just so … humbling. About a week later, though, I opened that sucker up again feeling strangely optimistic. It had occurred to me that my real problem with decluttering my cedar chest was simply the guilt I was feeling about everything inside — of not liking gifts that were given to me, or not fixing items that were broken, or wasting money on some knickknack, or potentially hurting someone’s feelings by giving it away. And as if that epiphany wasn’t enough, I’d also realized that my decluttering style needed a bit of an update. I like to make piles to ensure that my crap, I mean treasurers, get into the right hands. Even though I know there ARE NO RIGHT HANDS. And despite the fact I have counseled against doing THAT VERY THING. And also: Those piles really stress me out. Which is how I ended up taking a load to Goodwill this Sunday and forgoing piles all together. Well, not altogether, I guess — there was some family stuff in there we’d been given, and I wanted to make sure those who had gifted it to us at least had the option of getting it back. But when the Goodwill kid came out to the car to meet Johanna and I curbside and took away those bags of picture frames, holiday decorations and a few of Jo’s old books (that kid has no problem purging at all, I can tell you that), I just … it was such a weight off my shoulders. It was a gift to myself, honestly. But the real test is going to be when Eric brings up the Christmas boxes when we start decorating in earnest. (With Johanna’s birthday on the 13th, we try to separate her birth and Christmas as much as we can.) Will I be able to keep up the momentum? Remember my lessons? Forego the guilt? 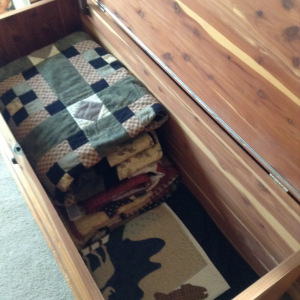 Well, regardless, my dream of keeping quilts in my cedar chest has come true, and that’s another gift to myself. I suppose it’s good to go through this decluttering process periodically, because being confronted with how difficult it is to get rid of stuff makes me even more aware of why we need to make careful decisions on what we bring into the house in the first place. I keep thinking I’ve learned all my minimalist lessons, but they just keep on coming. 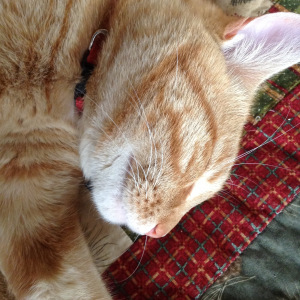 This entry was posted in Declutter, The Simple Year and tagged Decluttering, Holiday decluttering, minimalism, The Simple Year 5. Bookmark the permalink. Your line “being confronted with how difficult it is to get rid of stuff makes me even more aware of why we need to make careful decisions on what we bring into the house in the first place” really struck me as meaningful. Much too often we’ll use the excuse that the item is from Goodwill, it’s not expensive and it’s from a charity, to bring things home. (Especially books. So. Many. Books) But then it sits around, and I try to get rid of it, and my husband balks because it’s a cool book about Churchill, and I end up resenting the item for existing in my home. Being aware before it even comes home is the true method of reducing the clutter and stress.